Keeping a few strips of bacon in the fridge or freezer can go a long way. 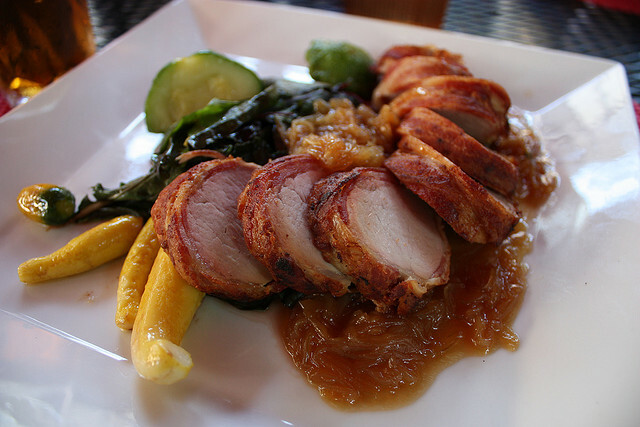 A little bacon accentuates a wide range of foods and dramatically enhances flavour – with little effort. Just 3-4 strips of bacon can turn a boring weeknight dinner into the comfort food you crave. Most kids like bacon, so why not include it in a healthy dinner? Vegetables, pastas, meats, seafood, sauces and pizza can all be accentuated with bacon! Here are 10 easy recipes where bacon is used in a variety of kid- and adult-friendly meals. Homemade pizza just got better. All you have to do is lay a few strips of bacon on top! Follow the recipe for pizza dough on the back of the Fleishman’s pizza yeast package (recipe available here) and lay rolled-out dough in pizza pan or stone. 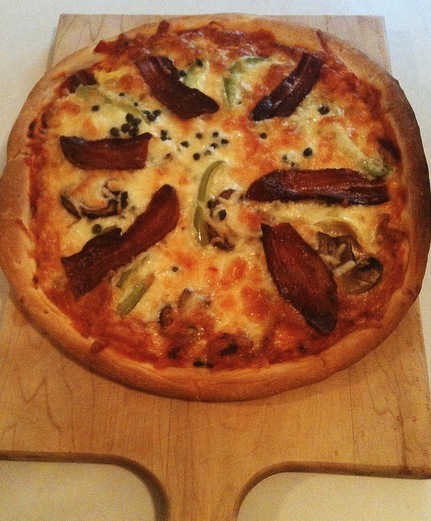 Spread tomato sauce, mushrooms, cheese, green peppers and lastly, the strips of bacon across the pizza. Bake at 400 degrees until cheese starts to brown a little on top (about 12-15 min). Serve with a simple arugula salad. 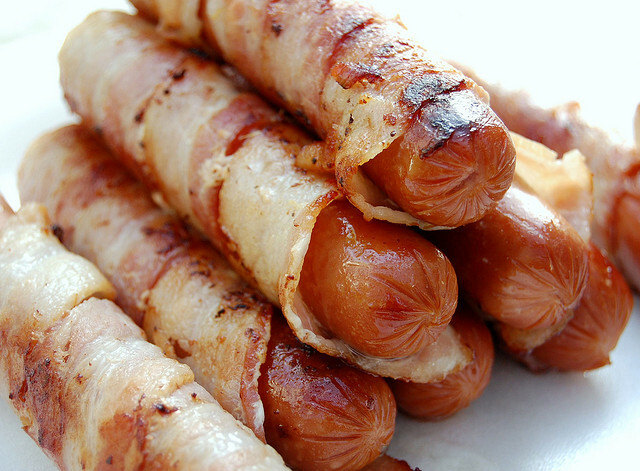 Fry the bacon wrapped hotdogs in a small quantity of oil in a heavy-bottomed skillet on low-medium heat or even better, a BBQ or campfire. Serve with your favourite hot dog condiments and coleslaw. See this wikihow if you need additional explanations. Bake a delicious whole chicken in just 45 minutes. Make a basic spatchcock chicken and add 5-6 slices of bacon across it! Spatchcock your chicken: Place chicken, breast side down, on a cutting board. Starting at thigh end, cut along 1 side of backbone with kitchen shears (or a big sharp knife). Turn chicken around; cut along other side. Discard backbone or save for stock. Flip chicken, and open it like a book. Press firmly on breastbone to flatten. Rub chicken with 1 tablespoon oil, and season with salt and pepper to taste (about 1/2-1 teaspoon salt and 1/2 teaspoon pepper). Brush 1 tablespoon oil in the center of a rimmed baking sheet and place chicken. Lemon option: place half the lemon slices in a single layer on top of oil on baking sheet. Place chicken, skin side up, on lemons. 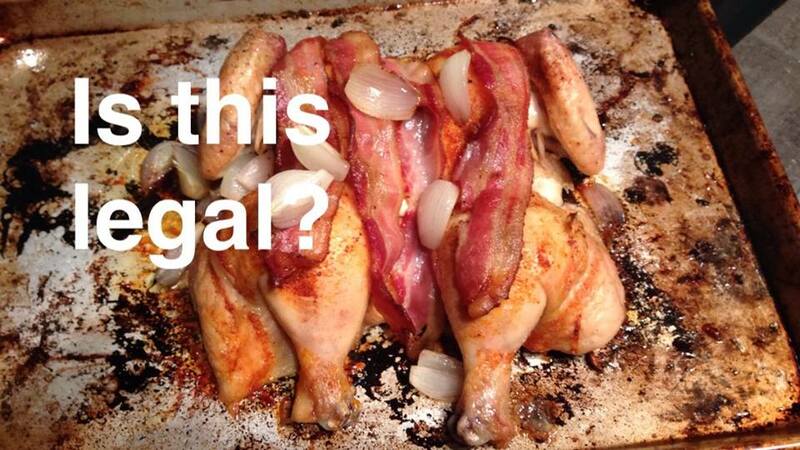 Lay strips of bacon across chicken. Shallot option: Toss shallots in some olive oil. Scatter shallots around chicken, 30 min into baking. Bake about 45-50 min at 400 degrees, or until chicken-juices run clear and the bacon is crisp. Slice strips of bacon down the center so you have two long, thin pieces. 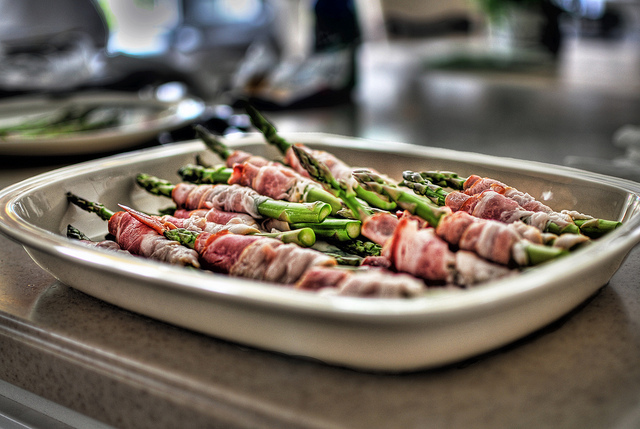 Wrap the bacon around washed and trimmed asparagus stalks and place on baking sheet. Place the baking sheet in the oven, and bake at 400 degrees (no need to preheat the oven). Bake for 20-25 minutes, or until the bacon is crisp. Because pork should always involve bacon. Make small incisions in the tenderloins and insert slivers of garlic. Sprinkle salt, pepper, preferred herbs or spices and rub with olive oil. Wrap tenderloins in bacon and secure with kitchen twine (or just gravity if you have no twine). Sear tenderloins in oil and butter in heavy-bottomed skillet until golden on all sides (about 10 min per tenderloin). Transfer seared tenderloins onto a roasting pan and place on oven for about 15-20 min or until cooked through. Transfer tenderloins to cutting board; let stand 10 minutes. Remove twine before carving. Spinkle Montreal steak spice on both sides of the steak. Wrap the steak with the bacon and secure with a toothpick. Heat an ovenproof, heavy-bottomed skillet over medium-high heat. Add the butter and olive oil. When melted, add the steak to the skillet and sear on both sides until golden brown, about 1 minute per side. Remove the skillet from the stovetop and place into the oven to finish cooking. 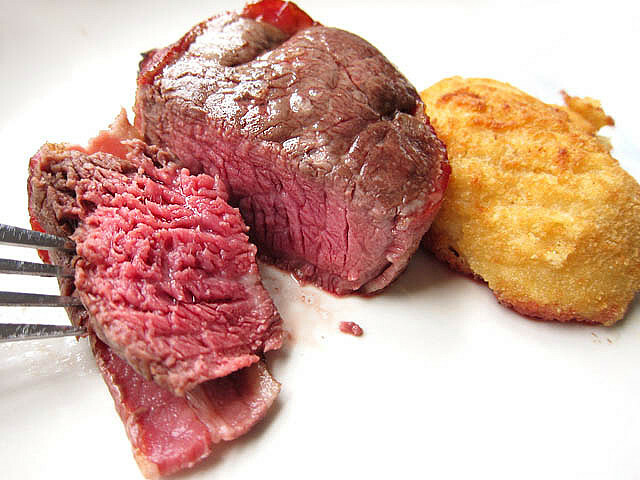 Cook until medium rare, 7 to 10 minutes. Remove from the oven and let rest for 5 minutes before serving. Boil pasta in a salted water in a large pot, following package instructions. While pasta is boiling, heat the olive oil in a large pan and sauté bacon on medium-high heat a few minutes. Add a bit of pasta water to soften the bacon. Reduce heat to low. In a bowl, mix eggs and grated parmesan with a fork. Add pepper to taste. 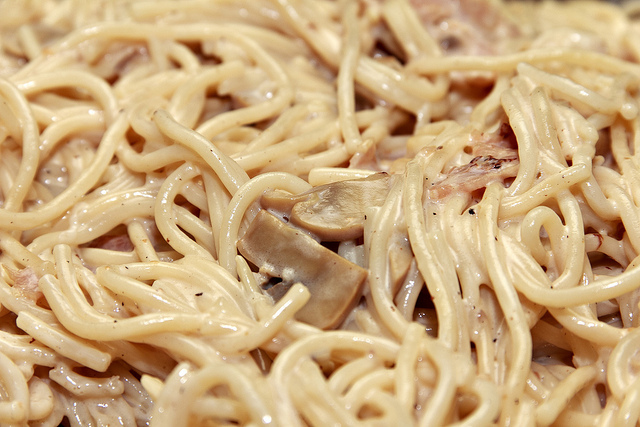 When pasta is cooked and strained, add to the bacon in pan and mix well. Take pan off the heat. Add mixture of egg and parmesan. Mix well to coat the pasta, sprinkle with parmesan and serve immediately. 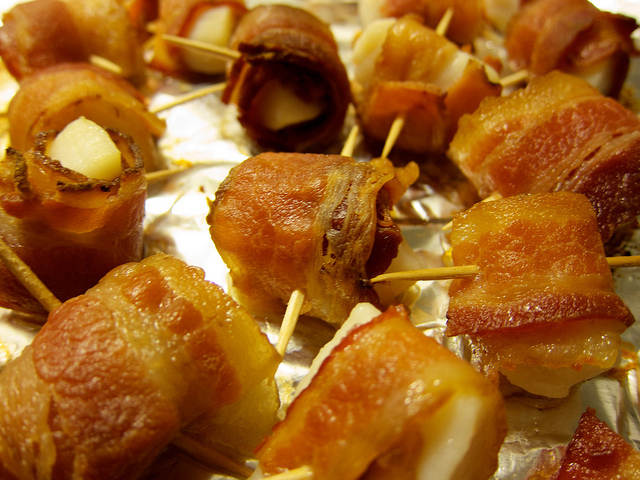 My 6-year old will actually eat scallops if they are wrapped in bacon. Heat the broiler. 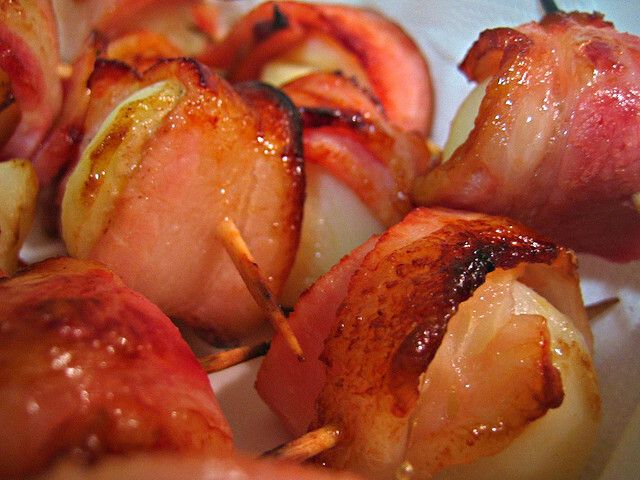 Wrap each scallop in a piece of bacon and secure it with a toothpick. Place the bacon wrapped scallops onto a baking sheet, drizzle with olive oil, and season with salt and pepper. Cook under the broiler for about 10 -15 minutes, until the bacon is cooked through, turning once. Make the spicy mayo by combining the mayonnaise, lime juice and chopped cilantro (optional). Stir well and refrigerate until ready to use. Bringing a package of bacon when camping is a must (if you have refrigeration or a cold cooler)! 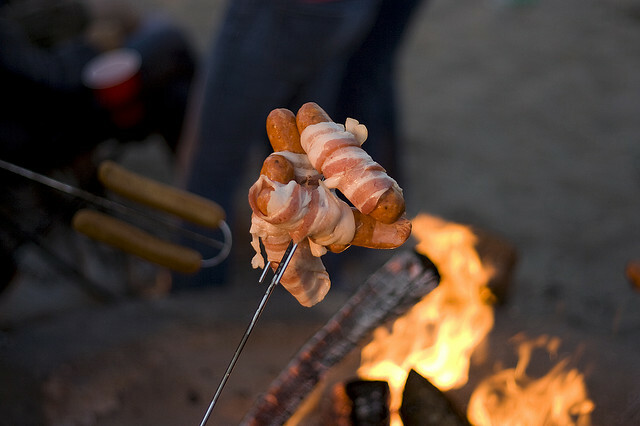 Chicken drumsticks, corn on the cob, hot dogs, potatoes and pork tenderloins can be wrapped in bacon and cooked over the camp fire. Foil packets of scalloped potatoes with chopped bacon, sliced onion and mushrooms are highly recommended baked over the campfire. Photos courtesy of Flickr.com creative commons: Pizza by Stacie Biehler; Bacon hotdog by Masa Assassin; Scallops by Colin Harris; Pork tenderloin by swirlingthroughts; Filet mignon by Jason Lam: Carbonara by David Gonzales; Asparagus by Adam Sacco. Baby potatoes by Vicky. Spatchcock chicken photo by A.W.